In 1939, with little capital investment, Leland H. Chin build and started the Pagoda Restaurant in Portland, Oregon. His wife, Frances Chin, agreed to work as a hostess without pay, so that Leland could meet all his obligations. In 1946, Leland sold the Pagoda Restaurant for $16,000, and used the money to purchase an old house at the corner of NE 42nd and Broadway. Two years later in 1948, he tore down the building in order to construct a new commercial building, which would be the home to Chin’s Kitchen Restaurant and Chin’s Import Export Co., Inc. (Chin’s). Chin’s Kitchen was subsequently sold in the 1970’s, and Chin’s relocated to a 10,000 square foot building in NW Portland, purchased by Fred & Betty Jean Lee. The business then relocated to a 15,000 square food facility on Swan Island for seven years, before a new building was constructed in 2008 in the Port of Portland’s Rivergate Industrial Park in North Portland. The new facility has enabled Chin’s close proximity to the Port’s Terminal 6 container facility and (3) container transfer terminals, as well as 20,000 square foot office warehouse complex. 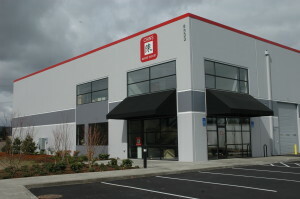 The Rivergate warehouse facility has enabled Chin’s to stock over 2,000 SKU’s (dry, refrigerated, and frozen), for distribution to its customers throughout the Pacific Northwest region. While canned food imports from Taiwan dominated Chin’s business, in the late 1970’s imports migrated to Thailand, due to high labor and production costs in Taiwan. Since that time, a vast majority of imports have now moved from Thailand to the People’s Republic of China (PRC). While food products continue to compromise about 30% of Chin’s business, the other 70% of the business is dominated by paper and plastic products tailored to the food service industry.